Classic VinoView 300-Bottle Wine Cellar offers the capacity of a small room cellar, handling 254 bottles with shelves in place, and up to 300 bottles with shelves taken out. As a utilitarian, single-zone free-standing cabinet, it's born for bulk, keeping your wine at the correct temperature and protecting your investments with state-of-the-art-performance. It features a black aluminum trimmed door with black aluminum handle and is the best possible environment for long term storage of prized reds, protecting them as they mature to peak perfection. Developed by our experts, we carefully considered all your suggestions on what would make our line of wine cellars even better. UV protected, dual pane smoked glass doors are reversible for easy placement anywhere in your home. Brilliant glow safely illuminates your bottles, showcasing your wine in style. Spacious cabinet is ideal for those whose collections include Bordeaux’s, California Reds and Pinot Noirs. Designed to comfortably hold up to 300 bottles* for the ultimate wine storage experience! 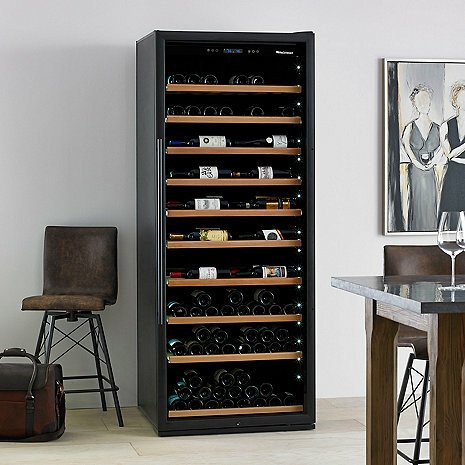 The advanced, spacious storage for the red wine collector: The large capacity single-zone unit is ideal for those whose collection is mostly red wines. Is it front-venting? Can it be installed within a cabinet? BEST ANSWER: This is a back vented unit. You will need to leave 4 inches above, 3 inches behind and build on a platform 3 inches high and have open space below. This would be the only way to build it in. Darren, can you elaborate on the required platform for the unit. I'm considering a converting a closet into a niche for the same wine cooler. Certainly will have 3+ inches clearance in back and more than 4 above. The niche will be open completely to the hallway, no trim or raised area. Why raise the wine unit 3 inches and is the open space below to the front and back, the sides? Very confusing. This is a back vented unit if you do not follow the clearances the heat will be trapped and the compressor will over heat and break down much sooner than it should . Raising the unit will essentially make an air tunnel where heat and cool air can flow freely. Now if you can do 2 -3 inches on each side then the 3 inches below is not necessary. Okay, that's good to know. I'd rather add clearance on the sides that raise it. Thank you for the added detail, makes mush more sense. I just intalled this unit. When I turn the interior light on, it turns off by itself after around 7-15 minutes. Is that normal?? I purchased my unit about a year ago. All of a sudden it has started shutting itself off for no apparent reason. I was not aware of this type of feature. Anyone else? How does this do with humidity control? Long term storage Facility temperature? BEST ANSWER: I purchased two of these units in March. I set both to 55 degrees. The temperatures vary throughout the day by 2 to 3 degrees above or below setting but never more than that. I read on line 45-65. I set mine at 55. Fridge cools to about 51, shuts off. As temp rises to about 58, it turns on and drops to 51 to cycle again. I think the answer would be answered by if the storage facility was temp controlled or not. I would ask the consults at Wine Enthusiast. David, yes this cellar can be used for long term storage. I store my red wine at about 55 degrees. I’m looking for a cellar I can keep in my garage. I live in Northern CA and the ambient temperature in my garage throughout the year ranges from the low 60s to occasionally 92. Would this unit work? BEST ANSWER: I don’t know. I keep mine in a basement. That said, >90F could be taxing the compressor, especially if you’re targeting 55F. Also consider the humidity implications of this temperature differential. It’s a great cabinet but I’d try to get it into an interior room or basement. Should be OK. My unit is in my garage also. I have a mini-split ac unit for the garage, but keep it 80 during the summer. That said, the worst you would face is that the cellar will have to work harder when it is in the 90s and when it is humid. Yes I believe so. I have a different unit that I keep in a garage with much more extreme temperatures from both ends and it has worked just fine. This unit is even nicer than the one I have in the garage. This wine fridge lived in my garage while I was doing a reno for 11 months. Live in Alabama, so add humidity to the temps you have. It was and is working fine, but I'm sure it's happy to now be inside. Sam, The suggested ambient temperature 60 to 90F. It is not recommended to store this in an area where the temperature will be dropping below or 60 or above 90. Is the entire cabinet metal or is it some other material? Metal. The unit is similar to a refrigerator. Hope that helps. Good question. I believe that it is metal that is powder coated black. Seems very well made. The exterior of the entire cabinet, other than the door, is metal. It is difficult to read the display. Should the display be lit? BEST ANSWER: The display is very easy to see if you are taller than around 5 feet. Thanks is there a way to turn it on? Thanks. Is there a way to turn it on? The display should be lit, yes. What is the extra small bracket and three screws for that came with the unit? BEST ANSWER: Not absolutely sure, but I think the bracket is used to secure the rear of the unit to the wall. I received these parts too, but didn't use them. When I asked this question, I was told it is used if the door is changed to open from the other side. Only readout on display panel is temp window. No other controls work ie c to f? BEST ANSWER: Press and hold the lock/unlock button. Then you will be able to change controls, turn on light, change temp, etc.. It will automatically relock after a few minutes. I just received this unit. Can't find any instructions on how to put on the lock. And how to use the lock? On my unit the lock is on the bottom center of the door. I did not have to put it on. I just used the key to lock/unlock it. The door is not closing properly. I need to lift it a little bit to ensure it is closed. Why is this occurring? Mine does the exact same thing. Other than that I’ve been very pleased with it so far. My temp is stuck at 41 degrees and I can't figure out a way to increase it. It's been 41 deg since it was new. My red wine is too cold. I can unlock it and the temp + button beeps when I hold it, but the set temp won't increase. The actual temp changes temporarily, but the set temp never does. I unplugged the unit to try to get it to reset to 61 deg without success...still 41 degrees. Can anyone help? BEST ANSWER: Sounds like a service issue. Have never experienced any problems with temp or thermostat. Should I store reds on top or the bottom of the unit to get them warmer than whites? BEST ANSWER: The top shelves, annoyingly, are quite a bit warmer than the lower shelves. We purchased and are trying to figure out how 300 bottles fit. How do I need to configure the bottles? It seems this unit uses charcoal filters but the manual does not say which model and how often to replace. Can you confirm it? BEST ANSWER: MFlorida, There is a filter on the back wall, upper right corner. It should be cleaned on an annual basis with a brush nozzle attachment with your vacuum. Thank you! We have to install an electric box and are thinking about getting two. How long is the power cord? How high above the floor does it enter the unit? Where on the unit is the power cord located? If the ambient temperature in the room in which I have placed my wine cellar has dropped below the temperature at which I have set the unit, and will most likely stay at that temperature for some time, am I better off just turning off the unit during this cold snap rather than keeping it running when it won't be able to achieve the temp to which I have set it??? How do you level the unit? We just received ours and it's on a hard even surface but is still slightly wobbly. The instructions are frustratingly lacking! Does the unit have wheels? 1) temp varies between top and bottom by 5 to 6 degrees. 2) when power goes out, which it does in Fl., resets to 61 degrees....seriously? You go on vacation and come back all wine at 61 degrees. FATAL FLAW. Classic Vino 300 bottle wine cellar--perfect! I have been looking for a cellar that would handle pinot noir bottles and other larger than standard bottle sizes--without having to either take out shelves or in other ways lose shelf space. I was told that this would fot the bill--and it did so perfectly with the top shelf handling magnums. Thanks to Dave at Wine Enthusiast for working with me on this. Just what I have been looking and hoping for. I've had this 300 bottle fridge for two months and it has worked great. Delivery went smoothly. It is quiet and holds temperature well when full. I have about 275 bottles in the fridge of varying shapes (some 375s) and it is full, so not quite 300 bottles. 1) Touch panel is a little unresponsive. I needed to hold my finger on the button for about a second before it would respond. 2) Lock should be in the middle of the side of the door rather than the bottom to make it easier to reach. Also, key has a spring in it so it can't be kept in the lock. I would prefer to keep the key in the lock. 3) Light would stay on for only about 3 minutes before going out. It should stay on for a long amount of time--maybe at least 30 minutes or an hour. Classic with fine stainless appointments. Interior lighting a nice touch. Unit is very nice adjustable shelves make it so larger Syrah and Chardonnay bottles fit nicely. This is a well constructed quality product. The temperature controls are very accurate. It’s tough, however to see how it can hold 300 bottles. The best I can do is about 225. Would recommend this to anyone.